Venezuela, Any Tricks Left For Halting Hyperinflation? Hyperinflation comes from ignoring some basic economic rules. That is unlikely to change any time soon under the Maduro government. 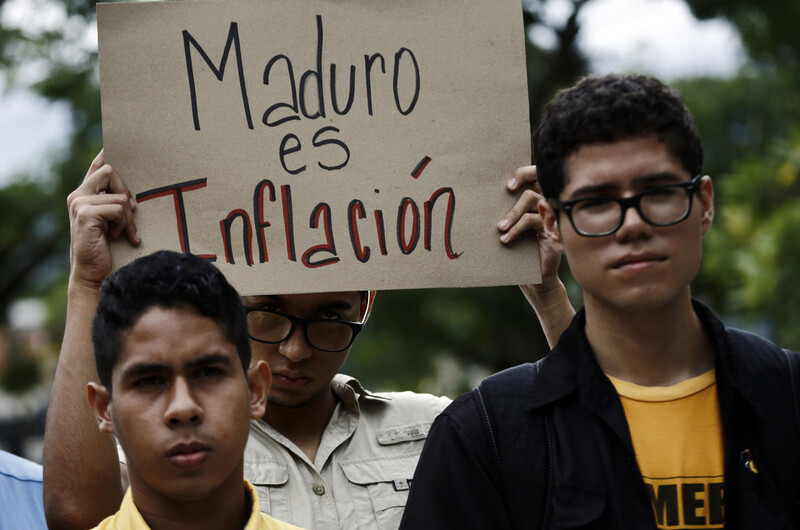 There are no official figures for inflation in Venezuela, but the International Monetary Fund (IMF) expects the rate to reach around 1,000,000% by the end of 2018. Whether or not that is precise to the decimal point, clearly Venezuela is suffering from hyperinflation. Inflation is the phenomenon of rising prices for all goods and services, which is normal. In Colombia for example, the inflation rate for 2017 was 4.09%. But hyperinflation is when price rises exceed a minimum of 50% in a month and it lasts for a period of at least one year. Some analysts estimate conservatively that daily inflation in Venezuela is 2.8%, which means roughly a 200% increase in prices monthly. Hyperinflation means banknotes and coins lose their purchasing power fast. For example, with a daily 2.8% inflation rate and supposing it will not rise further, if you were given a 100,000-bolivar note, within 30 days, you could buy only half of what you could purchase today. After 60 days, that would drop to 25% of what you could buy today, and after 100 days, the note would have 10% of its present purchasing power. In 365 days, the 100,000-bolivar note would have about 0.02% of today's purchasing power — in other words practically none. In layman's terms, a crazy situation. Protests against President Maduro in Valencia, Venezuela, on July 27. — Photo: Juan Carlos Hernandez/ZUMA. How did the country get here? There is no single reason, but clearly there are two important causes. One is the dearth of goods and services that pushes up prices. The second is the Central Bank's utter dependence on the government. This has meant an exaggerated emission of banknotes to finance public spending (including subsidies). This acted as a stimulus to inflation, which then accelerated to historic levels. Now with its own momentum, it is going so fast you cannot print banknotes fast enough to stay apace with it. There is already a shortage of banknotes to pay for the few goods you might find on supermarket shelves. The logistics of distributing the bills are complicated. In recent days, the government of President Nicolás Maduro announced new measures to curb hyperinflation. On August 20, five zeros will be eliminated from all current prices and existing banknotes will be removed from circulation to make way for a new currency, the "sovereign bolivar" (bolívar soberano). This is like trying to stop a train with a cardboard wall. It is impossible to adapt an economy to such a change within a month. The logistics of distributing the bills (supposing they have already been printed) across the land are complicated. In Colombia, for example, we have often discussed removing three zeros from the peso and all projects have proposed transition periods of between one and five years. This type of change in so short a period is unthinkable, especially in an economy that does not function efficiently. One of the most serious problems remains unresolved in any case, namely the Central Bank's independence (as the body emitting banknotes) from the government (which spends them). There is no assurance the Bank will not start pumping up emissions of sovereign bolivars to finance public spending, which would perpetuate hyperinflation. Certain other countries have turned to using the U.S. dollar as an anchor to curb inflationary processes. An example is Ecuador (which had an inflation rate of 96% in 2000). Using dollars would at least dry up this source of inflation while the government tackles the other front, namely reactivating the productive apparatus to boost the supply of goods and services. But that too is unthinkable in present-day Venezuela, for obvious reasons. Regrettably, hyperinflation won't disappear any time soon.